Nothing ruins a recent purchase quite like finding lower prices online as soon as you bring it home. With one of these barcode-scanning, price-crunching smartphone apps, that never has to happen again. A quick, relatively accurate barcode scanner from the company that provides the basic scanning functionality for many other apps on this list, including Amazon's, eBay's and FoodScanner's. Independent of any particular retailer or price aggregator (though now owned by eBay), RedLaser is free to search a variety of online sources for the best prices, which, combined with its best-in-group scanning ability, makes for a hugely useful app on any post-3G iPhone. Free, iPhone. A RedLaser alternative with a powerful price comparison engine, ShopSavvy is a good second line of defense against bum in-store deals, and occasionally finds a lower price than its competitor. Its only problem? It doesn't scan terribly well, especially on older iPhones. When it does work, though, it's quite fast. Free, iPhone. • Price Check by Amazon: Good for a quick barcode scan and ballpark price comparison, but the fact that it's limited to Amazon and its associated sellers limits utility. • eBay: This is an eBay app with a scanner widget, not the other way around. Only really appropriate for existing eBay users. • Pic2Shop: An early competitor to the likes of RedLaser and ShopSavvy, but lack of polish, unreliable scanning and a somewhat kludgy interface hold it back. • NexTag Mobile: Essentially an iPhone client for the NexTag price comparison engine, which is a bit too friendly to unreliable no-name online retailers. It's easy, as a good barcode scanner should be: fire up the Barcode Scanner, scan the barcode. It's a straight scanner, Barcode Scanner handles both UPC codes (which does a quick product search) and QR codes (which will give you options to add contact, show on map, download, etc) with ease and throws in a few extra features (like searching within a book you scan) as a bonus. Gives you an option to create your own QR codes too. Free, Android. An original Android app that's still great after all these years. ShopSavvy continues to stands out by being excellent at finding products for price comparisons, offering local listings and price alerts. It works with QR codes too and when the app gets updated in the next version (ShopSavvy 4), it'll bring a new deals section, a new crowdsourced product database and a prettier interface. Free, Android. • Key Rings Reward Cards: Recreates your rewards card for brick and mortar stores onto your Android phone. • Amazon.com: If you prefer shopping on Amazon (and who doesn't? ), you can use its app to scan products to find it there. 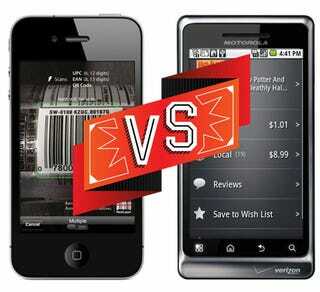 • The Coupons App: Uses barcode scanner to price match.